The "kits" of an Eastern cottontail rabbit. The Eastern cottontail is a species of rabbit known by the scientific name Sylvilagus floridanus. They are one of the most commonly found mammals in the Unites States and can be seen year-round. They are usually found in open grassy fields and among crowded plant growth along woodland edges and fields. They are very easily recognized mammals with their long ears and cotton ball-like tail. Although rabbits like the Eastern cottontail are unmistakable, they can be confused with hares. One distinction is that rabbits run and hares hop. People have different perspectives on rabbits. Some people, such as gardeners, suffer damage to their property and view them as a pest. They can do serious harm to vegetables, shrubs, or flowers. For hunters, they are an abundant, sporting animal for game. Others see them as cute, interesting creatures. Some people, simply, just don't care. Control is necessary to prevent further affliction, but complete extinction is neither necessary nor desirable. Damage control methods include hunting or live trapping. Eastern cottontail rabbit hiding in the shrubs from predators. 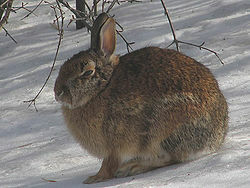 Eastern cottontail rabbits have small, dense bodies with long ears, large brown eyes, long hind legs, and a short tail. Their tail is shaped like a cotton ball, hence the name cottontail rabbit. Their fur varies from grayish-brown to reddish-brown in color. During the winter, the color changes to more grayish than brown. The fur under the tail, stomach, and around their nose is white in color. Almost all of them have a gray spot around their neck. An average cottontail rabbit can weigh between two to four pounds. The young of Eastern cottontails are called 'kits.' They have an extra white patch on their forehead, which fades as they get older. Cottontails are usually 15 to 18 inches long. Color tones and habitat characteristics are crucial in determining the dominant color type of rabbits found in a certain location. The cottontail rabbit is considered a medium-sized rabbit in which the nape of the neck is rusty. They have five toes on the forefeet and four on the hind feet. Females have four pairs of mammae, a milk secreting organ. The cottontail rabbit resembles rodents, but are actually lagomorphs. Unlike rodents, rabbits have large hind legs, a short tail, and two set of upper incisors. The females are usually larger than the male. Eastern cottontail's long, pointed ears are sparsely furred on the inside. They have a white chin, stomach, and throat. Its hind legs and feet are larger than its front, and all are well furred on the bottom. The Eastern cottontail breeding seasons begin later with higher elevations and latitudes compared to what they are used to. Temperature rather than diet has been known as a major factor, controlling the inception of breeding. The average period of pregnancy is 28 days, varying from 25 to 35 days. 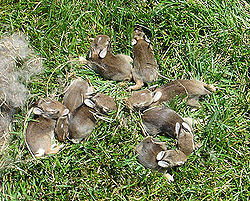 Eastern cottontail young are born blind and with a very thin coat of hair. They are naked and helpless, but grow and develop quickly. Their eyes open by 4 to 7 days. The young begin to move out of the nest for quick trips by 12 to 16 days. They are completely independent by 4 to 5 weeks. The male will mate with more than one female. The annual productivity of females can be as much as 35 young. The Eastern cottontail is a productive breeder. The number of young survival is largely a function of habitat quality; especially the availability of shelter and food within its habitat. Mature at four months old, some young cottontails may breed in their first year of life. Most, however, do not breed until the following spring. In the wild, a cottontail may live to be 4-6 years old. In captivity, it may live to be up to 10 years old. Eastern Cottontails have high mortality, rates with a death rate up to 80 percent per year. Their main predators include cats, domestic dogs, hawks, owls, bobcats, and coyotes. Other causes of death are inclement weather, disease, and vehicle collisions. Cottontails are normally found in open grassy fields along woodland edges. The Eastern cottontail does not hibernate. The main components of the cottontail's habitat include an abundance of well-distributed dense shrubs combined with more open foraging areas, such as pastures and grasslands. Normally, Eastern cottontails occupy in and around farms. They are also found in marshes and swamps and typically avoid dense woods. Eastern cottontails usually inhibit one home range in their lifetime, but home range shifts in response to weather and vegetation changes. The largest ranges are occupied by grown males during the mating seasons. Males fight each other to maintain mating priority and dominance. Their location ranges from eastern and south-central United States, Central America, eastern Mexico, southern Canada, and northernmost South America. They are abundant in Midwest North America, and they have been found in Arizona and New Mexico. The Eastern cottontail rabbit is an herbivore. It consumes multiple plants including clovers, poison ivy, grasses, vegetables, and fruits. In the winter, their diet becomes a bit course. The rabbit eats the woody sections of plants like bark and twigs of birch, brambles, maples, dogwood, and oak trees. Their diet also depends on availability. Arthropods have been found in their pellets. The Eastern cottontail rabbit has a bit of a preference when it comes to what they eat: twigs, branches, and stems up to 0.25 inch. 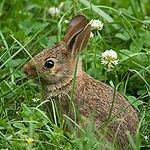 In the summer, cottontails prefer tender green herbaceous vegetation, if available. Some crucial dietary components include Canada bluegrass and Kentucky bluegrass. Eastern cottontails consume a variety of plant materials. Feeding patterns depend on the season, but normally they eat two to three hours after dawn and an hour before sunset. Cottontail rabbits also eat their own feces, a behavior due to the inefficiency of the rabbit's digestive system. When the rabbit excretes, some of the pellets are moist, green, and include undigested food. The rabbit swallows this without chewing. The continuous passage through the rabbit's intestines allows time for bacterial digestion to repeat, and more nutrients are made available for absorption by the rabbit. The redigestion of food is important for the survival of an herbivore that usually interrupts its feeding as a result of fleeing from a predator. Eastern cottontails are most active at dusk and dawn. The crepuscular ("dusk and dawn") pattern of activity is amplified in the summer by a nocturnal time expansion. During the day, the rabbit remains safely hidden from predators in bushes or thickets. Cottontails that are faced with danger either dart away in a quick, zigzag manner or freeze in their place to perform their cryptic coloration. Their running speeds can reach eighteen miles an hour. Cottontails are known to be solitary animals and can be aggressively intolerant of other members in their species. Generally the rabbit is silent but they communicate by thumping the ground with their hind feet. They produce a spine tingling scream once they have been caught by a predator in order to frighten them. ↑ Craven, Scott. Cottontail Rabbits. Internet Center for Wildlife Damage Management. Web. accessed on January 30, 2012. ↑ Nair, Sonia. Facts about Eastern Cottontail Rabbit. Buzzle. Web. accessed on January 17, 2012. ↑ Lee, Edward. Eastern Cottontail Rabbit. The Virtual Nature Trail at Penn State New Kensington. Web. June 12, 2010. ↑ Linzey, Don.Sylvilagus floridanus (Allen). DiscoverLife. Web. November 26, 2005. ↑ Eastern Cottontail. Virginia. Web. accessed on January 18, 2012 Unknown Author. ↑ 6.0 6.1 Unknown Author. Eastern Cottontail- Sylvilagus floridanus Nature Works. Web. accessed on January 18, 2012. ↑ Eastern Cottontail Rabbit. Wikipedia. Web. accessed on January 18, 2012 Unknown Author. ↑ Carter, K.S. Eastern Cottontail Rabbits. Michigan DNR. Web. December 19, 1999. ↑ Jacobs, Kathy. Eastern Cottontail Rabbit. Natural Resource. Web. accessed on January 29, 2012. ↑ Cottontail Rabbit. National Geographic. Web. accessed on January 30, 2012 Unknown Author. ↑ 11.0 11.1 Cottontail Rabbits. Mass Audubon. Web. accessed on January 30, 2012 Unknown Author. This page was last modified on 19 January 2016, at 16:31.